To help fellow wine enthusiasts have access to the many cellaring options. To share our buying guides and tips about storing wine properly in wine coolers. 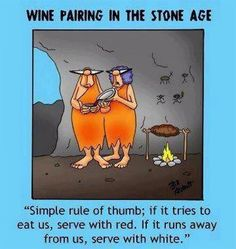 To share techniques, wine pairing and information to enjoy your wine. Budget – what is the best value for your money. Styling – material, colors, types of door handles, etc. Usability features – adjustable shelving, lock, location of the temperature control panel, LED light, etc. Warranty: check for in home warranty repairs for added convenience. Ultimately, the purpose of a wine cooler is to preserve your wines while allowing them to bloom, for your future enjoyment and your investment. Here we provide our review of the top rated wine cooler brands on the market today. This top-rated list is sorted by capacities, types and budget. At the end of this page, please refer to our wine cooler buying guide for a complete selection check list to aid you with your buying decision. Dimension: (per unit) 69.5″ H x 23 7/16″ W x 26.75″ D, or 69.5″ H x 46.875″ W x 26.75″ D for the double unit described here. Summary: The EdgeStar 332 Bottle built-in or side-by-side Wine Cellar (View on Amazon) is both stylish and functional for those with larger wine collections. Its great set of features are sure to impress you and your guests. It has the flexibility to be a free standing or a built-in wine cooler with large capacity. The Edgestar 332-bottle is a dual-zone. 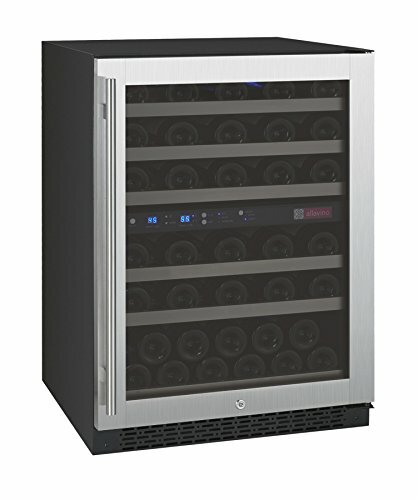 This wine cooler has a very quiet compressor and it features easily changeable carbon filters to remove any unwelcome odors. It has UV blocking glass, and easy-to-use digital touch controls. 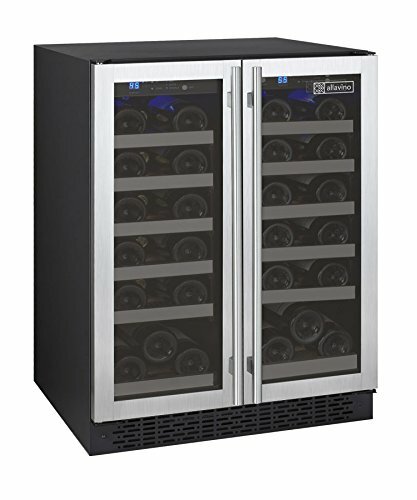 This large-capacity EdgeStar wine cooler has a 1-year parts and labor warranty. It also receives outstanding reviews from customers, who give excellent reviews for the sleek styling, functionality, and quiet operation. 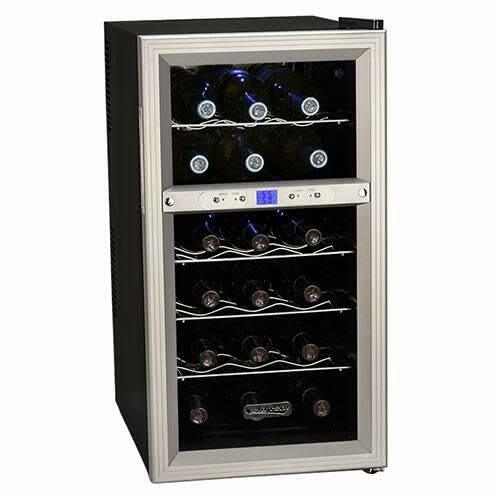 The EdgeStar is a winning choice for a large-capacity wine cooler, and certainly has our seal of approval as a top rated larger capacity wine cooler. Read our review for EdgeStar CWR1661SZDUAL 332 Bottle Side-by-Side. Brand and Capacity: Allavino FlexCount 172-bottle VSWR172-2BWRN (right hinge)/Allavino FlexCount 172-bottle VSWR172-2SSLN (left hinge) wine fridge. Summary: The Allavino VSWR172-2BWRN 172-bottle (right hinge)(View on Amazon) or the The Allavino VSWR172-2SSLN (left hinge)(View on Amazon) is a sleek-and-sophisticated dual-zone wine fridge. It is a large capacity wine fridge that accommodates 172 bottles and it has a security lock. The Allavino VSWR172-2BWRN has a front-venting design – you can install it as a built-in to your cabinetry or as a stylish free-standing unit. We are a fan of Allavino’s FlexCount shelving design series, including this 172-bottles, the 128-bottles, the 56-bottles and the 36-bottles models. The Allavino VSWR172-2BWRN has 14 innovative FlexCount shelves and sturdy metal racks. This model features dual zone that allows individual temperature control in the upper and lower zone respectively. The upper zone can be set between 40°-55° F. The lower zone can be set between 55°-65°F. This Allavino has elegant black cabinet with matching framed glass door and all-black interior. Read our review for Allavino FlexCount 172-bottle VSWR172-2BWRN (right hinge) or Allavino FlexCount 172-bottle VSWR172-2SSLN (left hinge). 116 Bottle Capacity: The robust 116 bottle storage is perfect for red and white wines. Summary: This beautiful NewAir AWR-1160DB 116-bottle premier gold series wine cellar (View on Amazon)is our top pick for 116 bottles capacity wine cellar. It has many premium features for a high-quality 116-bottle wine cellar such as premium cold-rolled steel cabinet with three layers of insulation, smoke-tinted triple layer glass door, smooth gliding shelving, elegant gold LED light and the 1-year in home warranty. You can install this unit as free-standing wine cellar or as a built-in to your cabinetry. It has a reversible door – a convenient design feature to set it up to open to left or right to fit your design configuration. This NewAir AWR-1160DB is a dual-zone wine cellar, top zone can be set from 40°- 50°F and bottom zone from 50°- 60°F. 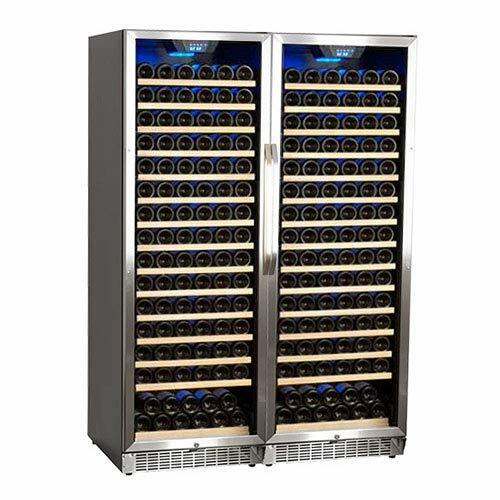 This range of temperature cooling feature gives you options to store various vintages such as Beaujolais, Chablis, Champagne, Chardonnay, Cabernet Sauvignon, Pinot Noir and Sauternes, etc. You can switch between Celsius and Fahrenheit. The premium NewAir AWR-1160DB has both the form and functions that live up to the name of ‘gold series’ and it justifies the price tag of an ounce of gold. Read our review for NewAir AWR-1160DB 116-bottle premier gold series. Brand and Capacity: Allavino FlexCount 56-bottle VSWR56-2SSRN (right hinge) or Allavino 56-bottle VSWR56-2SSLN (left hinge) wine fridge. 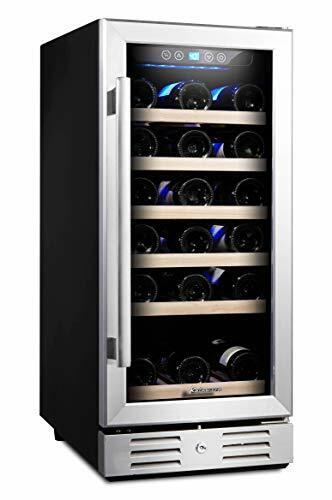 Summary: The Allavino FlexCount 56-bottle VSWR56-2SSRN (right hinge) (View on Amazon) or the Allavino VSWR56-2SSLN (left hinge) (view on Amazon) is our top pick for 56- bottles dual-zone wine cooler. It has a front-venting design that works well as a built-in your cabinetry or as free-standing unit. This model is about 25% more energy efficient than most compressor-based wine fridges in its class. We find this model has minimum temperature fluctuation and low noise and vibration. This model is in the Allavino’s FlexCount shelving design series – the shelves are thin and flexible to accommodate larger diameter bottles without sacrificing overall storage capacity. It has six shelves – five shelves that can fit up to 9 bottles each and a bottom shelf that can fit up to 11 bottles for a total of 56 bottles. This Allavino dual zone unit features “red”, “white”, and “sparkling” indicator lights. You can adjust each zone’s temperature separately – an upper zone range between 41°-61°F and a lower zone range between 45°-64°F. It has an intuitive control panel. You can control the interior blue LED lighting via the easy-to-use control panel. This Allavino model includes both curved and towel bar handles – you have more options to integrate this unit with your design elements. Read our review for Allavino FlexCount 56-bottle VSWR56-2SSRN (right hinge) or Allavino 56-bottle VSWR56-2SSLN (left hinge). Summary: The Kalamera KRC-46DZB-TGD 24-inch-wide 46-bottle wine cooler (view on Amazon) is is one of the most popular mid-size wine coolers. It has a versatile installation as a under-counter built-in or a free-standing unit. It is a quiet compressor-based cooler with many premium features such as triple-layer tempered glass door, consistent cooling and temperature memory function . This Kalamera has five sliding beech wooden shelves with a capacity of 46 bottles. It has a dual zone cooling system; 40°-50°F in the upper zone, 50°-66°F in the lower zone. Read our review for Kalamera 24-inch-wide 46-bottle wine cooler. Type: Free-standing or built-in or under-counter. Summary: The Allavino FlexCount 36-bottle VSWR36-2BWFN wine cooler with French Doors (view on Amazon) is our top pick for the most beautiful 36 bottles capacity dual zone wine cooler. It can accommodate 36 bottles in a compact 24″ wide space. This model has classic black cabinet and gorgeous black framed glass French doors. It is beautiful as a free-standing unit with its fully-finished front venting cabinet, or as a built-in or under-counter to fit your cabinetry design element. This unit is in the Allavino’s FlexCount shelving design series – the shelves are thin and flexible to accommodate larger diameter bottles without sacrificing overall storage capacity. This Allavino has dual zone, each zone is individually controlled and it ranges between 40°-60° F. It can accommodates 18 bottles on each side/each zone. It features an intuitive design control panel, cool blue LED interior lighting that you can turn on or off and a security lock. Read our review for Allavino FlexCount 36-bottle VSWR36-2BWFN French door wine cooler. 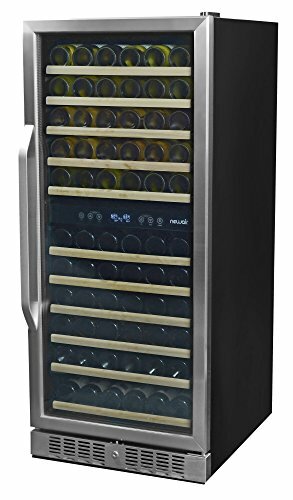 Summary: This Kalamera KRC-30SZB-TGD 15-inch-wide 30-bottle wine cooler (view on Amazon) is our top-pick for size 30-bottle built-in wine cooler. It is versatile in its installation options – freestanding or as a perfect under-counter fit for your outdated trash-compartment. This Kalamera has a double-layer insulated tempered glass door – which is reversible. This single-zone unit has a temperature range of 40°-66°F and a smart temperature memory function. Read our review for Kalamera 15-inch-wide 30-bottle wine cooler. Summary: The NewAir AWR-280E 28-bottle thermoelectric wine cooler (View on Amazon) is the best-value of 28-bottle thermoelectric model on our list. It is quiet and vibration-free. This Newair model looks especially great in modern decor – with its black cabinet and chrome racks. NewAir AWR-280E is affordable and has many useful features including removable shelves, digital temperature controls and cool LED light. 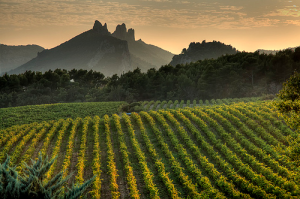 It is single-zone with temperature range: 54°-66°F – choose 55°F if you want to keep both red and wine in this unit. This NewAir does not have a lock. 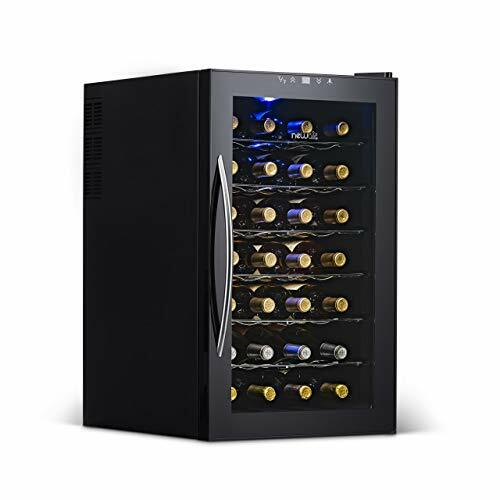 If you are looking for a budget-friendly single-zone thermoelectric wine cooler for a collection of a couple dozens of wine, the NewAir AWR-280E is a good choice. Read our full review for NewAir AWR-280E 28-bottle thermoelectric wine cooler. Summary: The Koldfront 18 Bottle thermoelectric Wine Cooler (view on Amazon) is an outstanding product that is moderately sized and unusually value packed for its size. Dual zone compact wine coolers are somewhat unusual; this is a key feature of this counter-top wine cooler. Its compact size allows placement in a variety of places. You get many features you’d expect to find in larger and more expensive coolers in a conveniently-sized wine refrigerator. So long as its capacity is sufficient for your needs, you will appreciate the small size of the wine cooler and the vibration-free silence and energy efficient operation that comes from a thermoelectric cooling system. Attractive LED lighting both lights and displays your collection. Don’t miss this outstanding choice of a smaller wine cooler. Internal fan-forced circulation guarantees even temperature distribution, ensuring all of your wine is kept at your desired storage temperature. Read our review for Koldfront 18 Bottle thermoelectric wine cooler. 12 Bottle Capacity: Compact, 12 bottle storage, perfect for red or white wines. Summary: This NewAir AW-121E 12-bottle thermoelectric wine cooler (view on Amazon) is the best-value of size 12-bottle thermoelectric-based wine coolers. This small wine cooler is quiet and compressor-free. It has a small foot print at 19-inch tall – you can easily house it anywhere indoors, especially as a counter-top wine cooler. This is a single zone with temperature range of 54°-66°F. It has a digital temperature display with push controls. It features three easy slide-out chrome shelves and cool LED illumination. Read our review for NewAir 12-bottle thermoelectric wine cooler. This buying guide provides you with the information and tools you need to make a wise choice of a wine cooler from those recommended here. You should keep in mind the words of George R. R. Martin in The Mystery Knight—“Wine makes all things possible”, and our wine cooler buying guide makes buying a wine cooler not only possible but easy and rewarding. There are several factors that may prove important in your selection of a wine cooler. Wine coolers come in several major categories among which you must choose. A wine cooler may be freestanding, may fit under a counter, on top of the counter, or be built-in. Freestanding. Perhaps you prefer freestanding wine coolers (those meant to sit on your counter, under your counter, or on the floor in some appropriate room). Since freestanding wine coolers may be viewable from all sides, the design and finish are important considerations. Some freestanding wine coolers may also be built-in. Built-in wine coolers are those that are intended to be permanently built into your cabinetry. These wine coolers are typically only viewed from the front, and are often not stylistically finished on the other sides of the appliance. It’s important to know that not all wine coolers can be built in; the direction of venting and cooling requirements may preclude building in some wine coolers. Wine storage rooms that become structurally part of your house or business. While these can be fun, discussion of those is beyond the scope of this website. A friend in Geneva, Switzerland, where bomb shelters are required in all new construction, had converted his bomb shelter into a very elegant wine cellar and tasting room. He had the advantage of knowing that, in the worst case, he would enjoy his days in the bomb shelter. Obviously you want your wine cooler to be large enough to store your collection of wines. Wine coolers can vary in size from 6 to 300+ bottles capacity. If you are a serious collector and have room, you may want a capacity of several hundred bottles of wine. If you live in an Airstream trailer, an eight bottle cooler may be all you can fit. How large a space do you have available for your wine cooler? Height, depth, width and weight are important. Do you want the door to open to the right or left? Measure the space in which you plan to house your wine cooler; make sure there is adequate room for ventilation. If you are installing a built-in, you want to allow two inches on all sides and the top. Decide Where will the cooler will be placed? Do you want it to fit on a countertop? Do you want it to slide under an existing countertop or table? Or do you want a wine cooler that occupies a more substantial space with concomitantly larger capacity? Do you want a single zone or dual zone wine cooler? The zones refer to temperature zones. Typically wine coolers maintain a significantly warmer temperature than conventional refrigerators, but they may maintain a single temperature throughout (called single zone), or they may have two different areas with two different temperatures (called dual zone). Often collectors prefer that different types of wines be stored at different temperatures for proper bouquet and preservation. Wine coolers use two kinds of cooling technologies; most use a compressor (like a home refrigerator), while others use Thermoelectric cooling. Each cooling type has advantages and disadvantages. A compressor will easily cool your wines and is a well-tested and reliable technology. The downside is that compressor wine coolers tend to be a bit noisier and to have a bit of vibration. 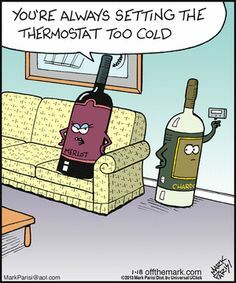 Thermoelectric wine coolers are generally quieter and with no vibration but they may not cool as efficiently. Thermoelectric wine coolers use the Peltier effect to create a heat pump between two plates. This effect can be effectively used to refrigerate a wine cooler, but the effectiveness of it depends on external temperature, so it is somewhat limited in its capacity to rapidly cool large wine collections or to operate in high ambient temperatures. Often a key choice factor for a wine cooler is the styling of that cooler. Do you want stainless steel? Do you want smoked glass? Do you want cool LED lighting to show off your collection? Do you prefer to access the temperature control panel inside or outside of the cooler? Do you want single or double doors? Do you want French doors? Do you want a recessed door handle, towel-style door handle or curved-handle? Do you like top-front mounted handle or side-mounted handle? Style is mostly a matter of personal taste but may be important in fitting with other aspects of your décor. Interface. Like many appliances these days, wine coolers may have interfaces that range from very simple (a dial to rotate to set temperature, for example) to more functional and more complex (including touchscreens). Some wine coolers place the user controls inside the cooler itself while others have a separate external panel. Consider whether you would strongly prefer one style or the other. Again this is mostly a matter of personal taste and the functionality you want to have in your wine cooler. Temperature memory function – Do you encounter power outage often in your neighborhood? If so, you want a unit that will restore the set temperature when you have your power back on. A lock. Having a lock is important to many wine cooler purchasers. It’s a good feature to prevent unwanted guests or children from accessing your vintage collection. Shelving material. Shelving is an important usability consideration. There are metal, wood, and wood trimmed metal shelves available. Adjustable shelves. A smooth-sliding shelving is a must in our opinion. Do you need removable shelving? Look for shelves that slide and that are adjustable or removable to accommodate unusual bottle sizes. Carbon filters. Some wine coolers incorporate changeable carbon filters to control odor. If this is important to you, make sure the filter can be readily changed. Most of our top-picks fall into similar price ranges based on capacity. Just be aware that larger capacity generally implies higher price. In general, a small counter-top model is less expansive than an under-counter built-in wine cooler. Typically a 100-bottle capacity wine cooler costs more than a 36-bottle wine cooler. Budget for $200-$400 for a counter-top thermoelectric small wine cooler. Budget for $500-$1000+ for an under-counter compressor-base wine cooler. Budget for $800-$1000 for a 56-bottle capacity wine cooler. Budget for $1000-$1500 for a 100-bottle capacity wine cooler. Budget for $2000 for a 150-bottle capacity wine cooler. 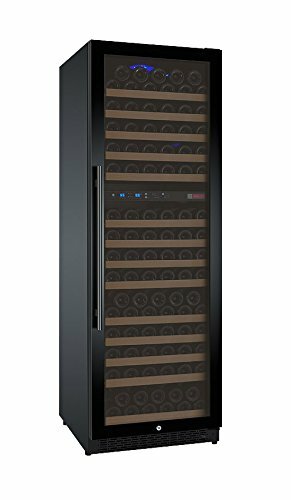 Our top pick for large capacity of 300+ bottles is the EdgeStar 332 Bottle built-in or free-standing side-by-side Wine Cellar (View on Amazon). This model provides two independent units with its own temperature zone environment. Check out our review of the EdgeStar 332-bottle model. 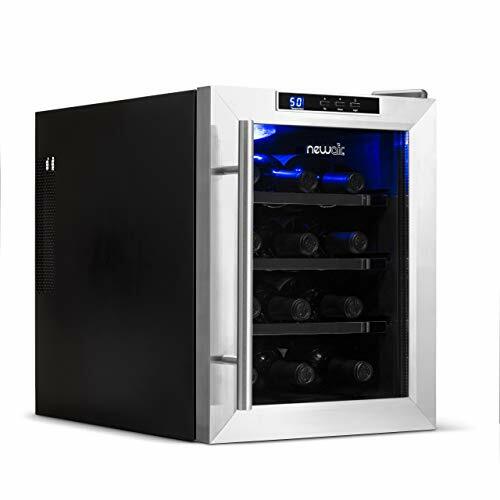 Our top pick for the 100+ bottle capacity is the NewAir 116-bottles gold series wine Cooler(View on Amazon). This beautiful free-standing or built-in, dual zone model has the best removable and smooth gliding shelving, and gold LED interior light. Read our review of the NewAir 1160DB Premier Gold Series. 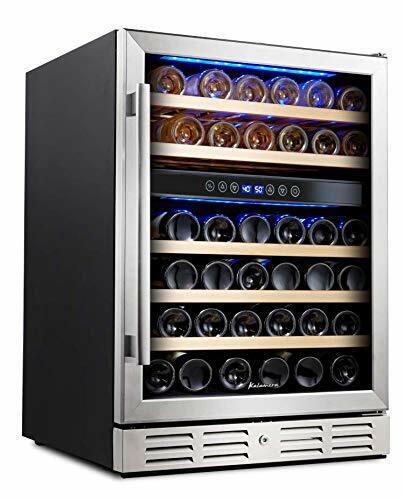 Our top pick for the 36-bottles is the classic beauty of Allavino FlexCount 36-bottle French door wine cooler (view on Amazon) . We like its black-framed glass French doors and black cabinet, and the flexible shelving that accommodates larger diameter bottles. Check out our review of Allavino FlexCount 36-bottle French door model. The very best wine cooler for you may not be the same as the best wine cooler for your friend. Being an astute shopper, you can use our best top 10 wine cooler reviews to understand which best fits your needs. 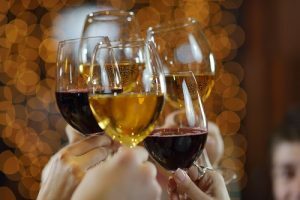 Enjoy your wines, your friends, and drink a toast to us from the very best wine cooler from our top 10 recommended list. 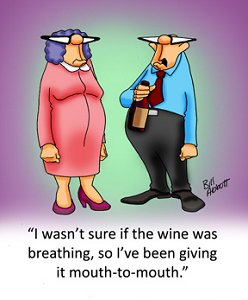 Here is our weekly funny dose of wine-related entertainment news and some funny wine cartoons found on Pinterest. Come back and visit with us soon. 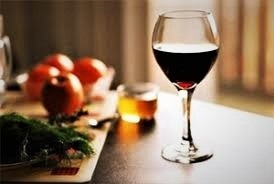 Is it necessary to aerate wine?